For the past 4 years, Singles & The City has hosted monthly live events in Dallas, Austin, Chicago, Detroit, Los Angeles and coming to a city near you! Sign up online for exclusive invites! Join us for the conclusion of Stop Saying "It's Hard"; Start Saying "It Requires Effort!" 🗣 In this episode OhSoStefanie speaks with good friend, Greg West - about the tangible process and steps required in he transition of change and what is it from a male perspective. He shares several keys to submitting to change, the God inspired isolation season, and how to combat and face your greatest temptations with the help of Jesus Christ. Follow our guest, Greg West | Mortgage Consultant | Credit Repair and all thing financial on Instagram Join us at a LIVE event in your city at www.singlesandthecity.com, Instagram and Twitter. In this episode OhSoStefanie speaks with good friend, Greg West - about the tangible process and steps required in he transition of change and what is it from a male perspective. He shares several keys to submitting to change, the God inspired isolation season, and how to combat and face your greatest temptations with the help of Jesus Christ. Follow our guest, Greg West | Mortgage Consultant | Credit Repair and all thing financial on Instagram Join us at a LIVE event in your city at www.singlesandthecity.com, Instagram and Twitter. Ever experience doubt that marriage will ever REALLY happen? 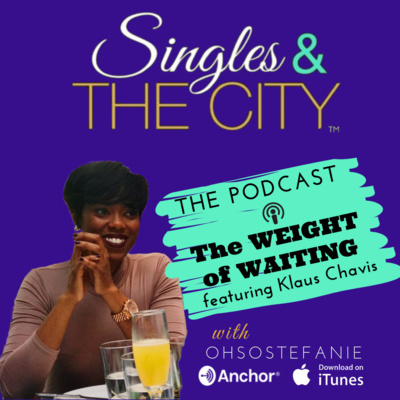 In this episode OhSoStefanie shares her most recent journey in singleness alongside a new friend, Klaus Chavis of Digital Disciple Ministries. He shares several keys to success in the journey of singleness and how to conquer the WEIGHT of waiting for God's timing. If you're in the Dallas area - we'd love to have you at our Dining & Discussion event on Feb 16, 2019! Event information is here. Feel free to follow Klaus Chavis on Facebook and YouTube. Host: OhSoStefanie at www.singlesandthecity.com and Instagram. In this episode OhSoStefanie explains how DM's and free meals won't feel the missing piece of your single journey. She shares her personal tips on how to survive truly being single - without entertaining unnecessary distractions. In this episode OhSoStefanie unveils the most solid way to manifest everything you want for 2019. As always, you know it's going to require a little something on your end - but the results will last a lifetime! 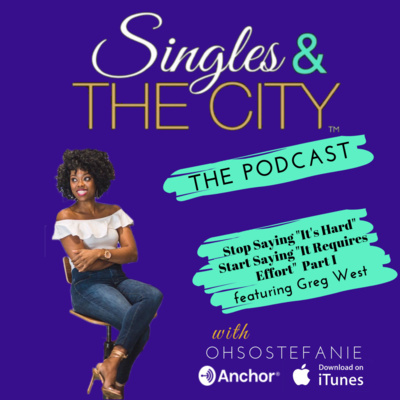 In this episode of Singles & The City - The Podcast, OhSoStefanie shares the power of accountability, how to choose the right accountability partner - and what to expect in this powerful and much needed relationship.